There's one special thing about raglan sweaters that I see overlooked in so many designs. This one special thing is the depth of the back neck. This is determined by how many stitches are cast on for the sleeves at the neck edge. Half of the sleeve cast-on measurement determines the back neck depth (and the front neck depth if it is worked the same as the back). This measurement, when added to the length of the raglan shaping determines the total length from the shoulder to the underarm, and is important to include for the desired armhole length to be accurate. For example, if you have 4" worth of stitches cast-on at the top of the sleeve, that would result in a 2" back neck depth. And, if the raglan shaping is worked over 5.5", the total armhole depth is 7.5". 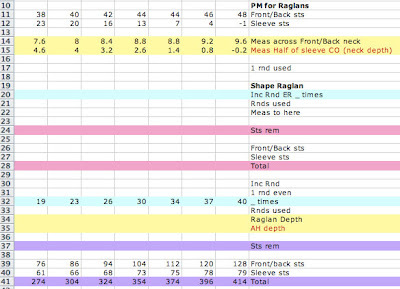 This is an important thing to keep in mind when writing the raglan shaping, because a 5.5" armhole is a lot smaller than a 7.5" armhole. That said, I'm inspired to share how I write a top-down raglan pullover pattern from A to Z. 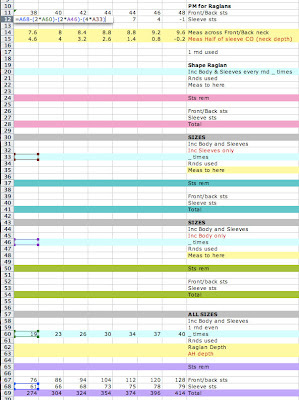 At the end of all this there is a link to download the free pattern, and the excel spreadsheet I used to create this tutorial. If you happen to knit this sweater, I'd love if you'd post some photos on Ravelry! There is also a Knit-A-Long group for you to join in the social-knitting fun! First, I'll begin with rudimentary measurements. I say rudimentary because if stitch patterns are involved, often the measurements will change slightly in order to account for matching the stitch counts of the stitch patterns. For this sample pattern, it's all knit in Stockinette Stitch—making things easy-peasy. 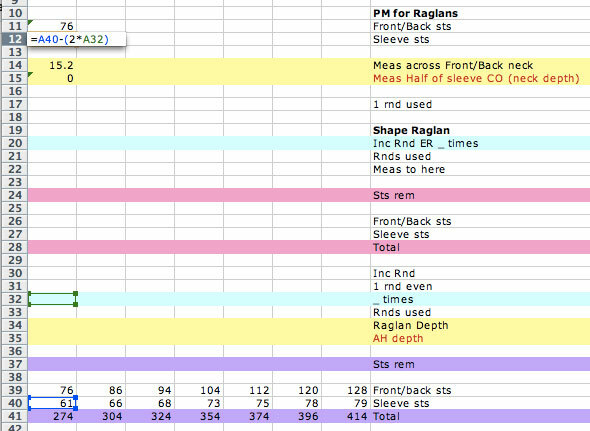 The most important measurements to know when beginning a raglan pattern are the finished bust circumference and the circumference of the upper arm. 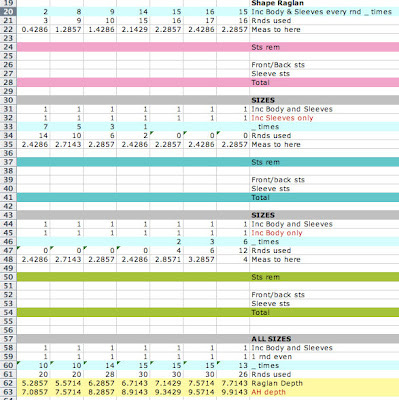 Bust Measurements: 32 (36, 40, 44, 48, 52, 56)"
Upper Arm Circumference: 13 (14, 14.75, 15.75, 16.5, 17.5, 18.25)"
And the gauge. We MUST know the gauge… of course. 5 stitches and 7 rounds per inch. Next we'll figure out how many stitches we'll need at the bust, and at the upper sleeve. 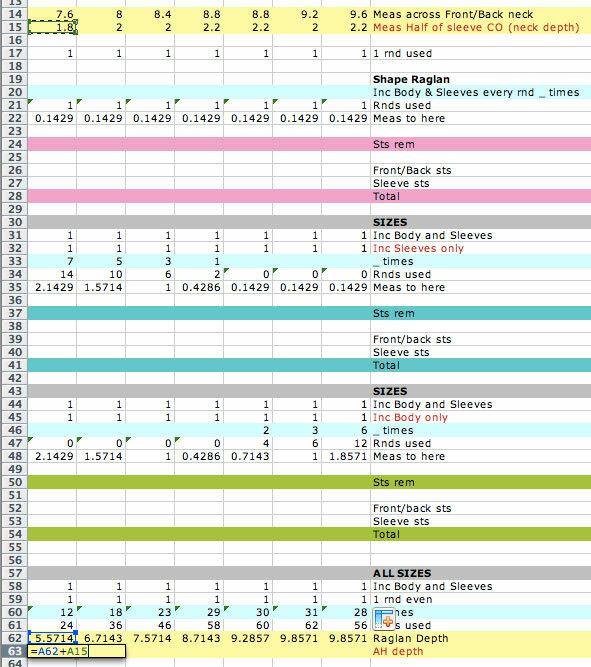 And… this is where I get Excel involved. 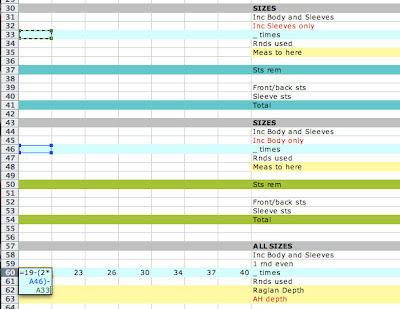 If you are unfamiliar with how to use excel spreadsheets for sizing your patterns. Check out this post I made once upon a time. 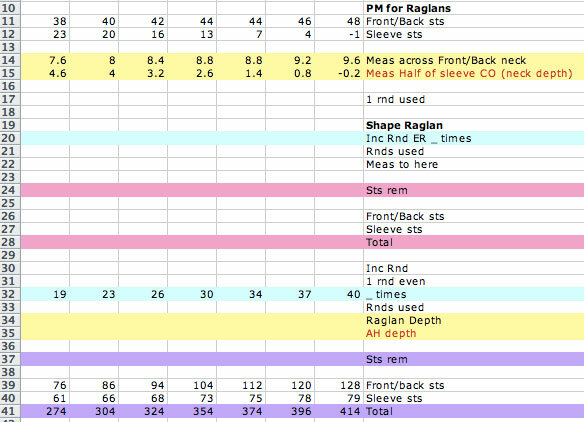 The first thing I'll do is set up my excel spreadsheet with all the descriptions of what I think I might need to know to determine the raglan shaping. 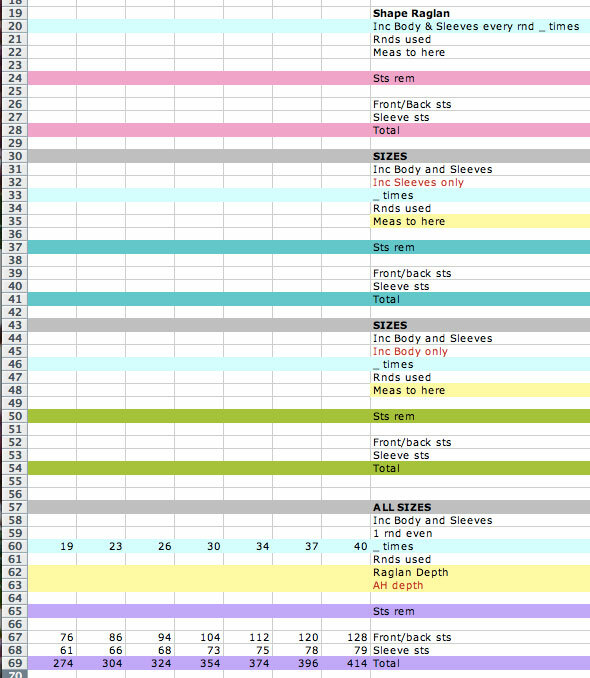 Basically, I'll need to know the number of stitches to cast on and how many of those stitches are used for each back, front and sleeves and what each of the measurements are. For the raglan shaping, I'll often have 2 or more sets of shaping—increasing at each raglan every row on the body and sleeves, and every other row on the body and sleeves. We may need to add shaping that happens just on the body or just on the sleeves—but I won't know if we'll need that until later, so I'll leave it out for now. 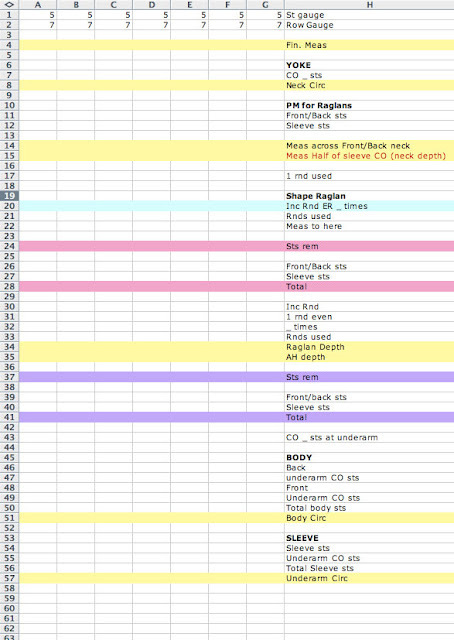 Then I fill in the most important information (bust and underarm measurements). And, determine how many stitches are needed to get to those measurements. The body stitch counts all turned out to be a whole number. 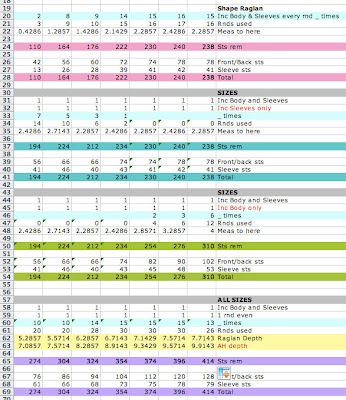 But, you can see that some sizes of the sleeves have decimals. I'll round those numbers to the nearest whole number and adjust the measurement accordingly. As you can see, it didn't change much. When working with a stitch pattern, be sure that these numbers match whatever the necessary multiple of stitches for that pattern. I like to have a few cast-on stitches worked at the underarm. I find that it is more flattering, and forms the natural curve of the body more than a sweater without it. I'll usually cast-on about 1/2" – 3" of stitches at each underarm. If I plan on having waist shaping on the body I'll cast-on an even number of stitches so it's easy to place a marker at the center on each side. This information gets filled in next. When I subtract the number of cast-on stitches from the body and the sleeves, I learn how many stitches I'll end up with at the base of the raglan shaping. That number is shown highlighted in purple, below. I'll walk you through the chart below. Read it from the bottom up, for the first size, in the left-hand column. For the sleeve. There are 65 stitches total, minus 4 cast-on stitches results in 61 stitches for each sleeve before the cast-on stitches. There are 160 stitches on the body and 4 stitches cast-on at each underarm, so, the number of stitches on each back and front before the cast-on would be determined by subtracting each set of 4 cast-on stitches from 160, which gives us 152. Then divide that in half to get the front and the back = 76 stitches each front and back. When we add 76 (front) + 61 (one sleeve) + 76 (back) + 61 (second sleeve), we get 274. Next, I'll figure out how much shaping needs to happen between the neck and the bust in order for the neck width and depth to fit comfortably. 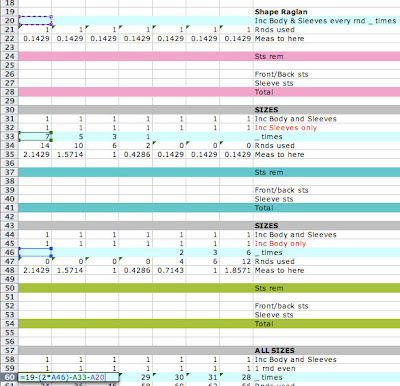 This is one of the reasons I love Excel. What I do here is set up the formula, then try out different numbers for each size until I get to the measurement that I want. In the chart below, I fill in a formula at the neck edge, where each front, back and sleeves are determined for the cast-on. For each the body and sleeve I'll take the number of stitches at the end of the shaping and subtract 2 stitches for each repeat of the increase row. This tells me how many stitches I'll need before increasing that number of stitches. 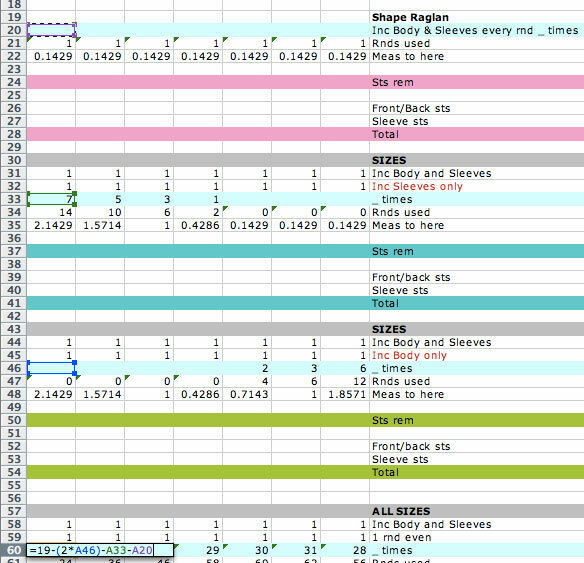 I'll also add the formula (highlighted in yellow, at the top) to tell me what these stitch counts will measure. This is what I use as an indicator to determine the perfect number of stitches. 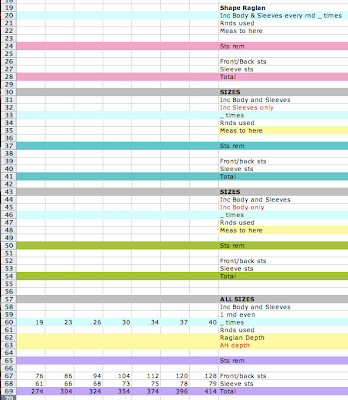 Once the formula is filled in and I drag it across for all the sizes, I begin entering numbers in the lower light-blue highlighted line, and the number of cast-on stitches for the front/back and sleeves will change accordingly. My goal is usually to make the neck no wider than 9.5". For the neck width to have a comfortable fit, it looks like we'll need to work 19 (23, 26, 30, 34, 37, 40) increase rounds on the front and the back, increasing 2 stitches each front and back on each of those rounds. But… look at the stitch count for the cast-on edge of the sleeve. I don't like the look of that. It seems that 19 (23, 26, 30, 34, 37, 40) increases won't work out so well for the sleeves. I usually like this measurement to stay relatively the same across all the sizes, or increase in size from the smallest to largest size. This does the opposite. To fix this, we'll need to work more sleeve increases for the smaller sizes, and fewer sleeve increases for the larger size. 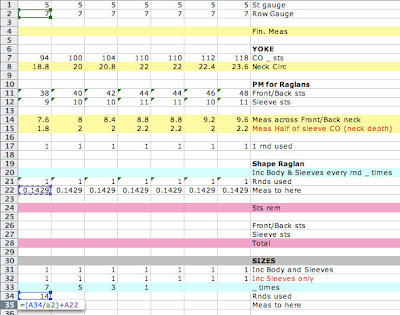 So, I've added 2 more shaping sections to my spreadsheet—one section for the smaller sizes that will work some rounds with shaping only on the sleeves, and another section for the larger sizes that will work some rounds with shaping only on the body. I add these extra rounds at the neck edge, incorporating them between rounds that have shaping on both the body and the sleeves. 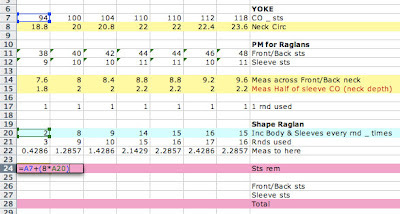 So, the basic structure of the raglan shaping begins at the neck with increases on the body and sleeves on every round, then it changes to alternating between 1 round of body and sleeve increases and 1 round of shaping on either body OR sleeves (depending on the size), then it changes to working increases on the body and sleeves every other round, with a round worked even in between. The reason I place the increases every round at the neck edge, is because of the shape of the body. When there are more increases at a faster rate at the neck edge, the shaping of the sweater expands quickly from the neck to the shoulders, then gradually from the shoulders to the underarm. If it is worked the other way around, the shaping doesn't flatter the body as well. See the diagram below for a visual. Then I adjust the formula for the cast-on stitches to include the shaping that may happen during these sections. 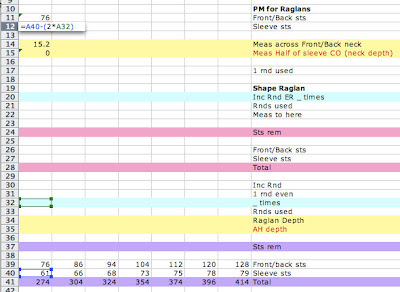 Because we know how many times to increase on the body, and we don't want to mess that up while playing with the number of individual body and sleeve increases, I turn the number of increases on the body into a formula to include the body increases worked during the individual body/sleeve shaping. Now I can play with adding numbers into the light blue rows to see how the number of stitches at the top of the sleeve adjusts, and tweak them until I have a measurement that I like. You can see that with the 7 (5, 3, 1, 0, 0, 0) extra sleeve increase rounds and 0 (0, 0, 0, 2, 3, 6) rounds with only body increases that the number of stitches for the body cast-on remains the same, and the sleeve cast-on stitches are now pretty similar to each other. 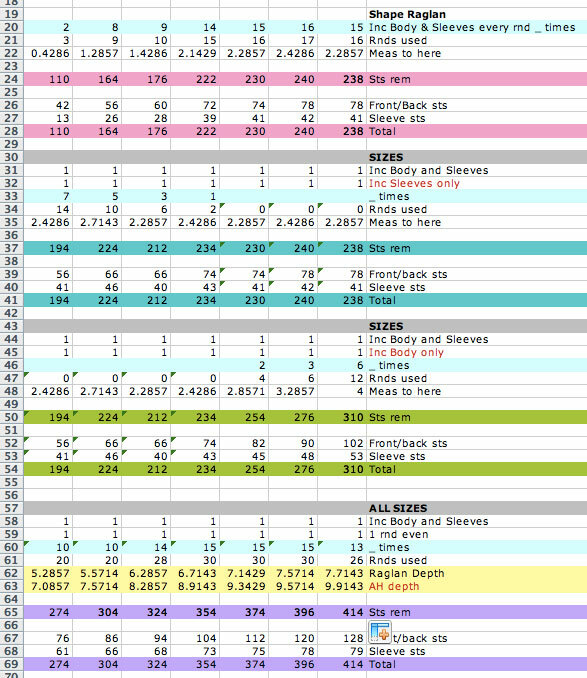 You'll also see that the number of body/sleeve increase rounds that are worked every other round have been adjusted accordingly because of the formula we entered to maintain the correct number of body increases. And, now we know how many stitches we'll need to cast on to begin knitting the yoke. I've also double checked the measurement of the total number of cast-on stitches to be sure it's large enough to fit over the head—which it is. Yay! The next thing we need to do is determine how many times to work the body and sleeve increases every row at the neck edge. This will determine the total number of rounds used for the raglan shaping and thus give us the raglan and armhole depth. 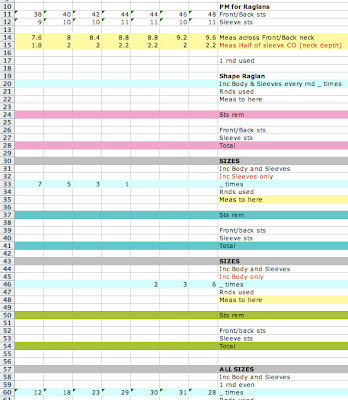 Let's fill in some formulas to make this easy to play with. Beginning at the top of my file, I begin by filling in the places where we will count rounds. Line 17 shows the round where we place the markers for the raglan, then line 20 will be filled in with how many rows are worked with increases on the body and sleeve every round. So, on line 21 we add them together to get the total number of rounds worked to here. On line 22, we divide the total number of rounds used by the row gauge to get that measurement. For each of the increase sections, we'll do the same thing. 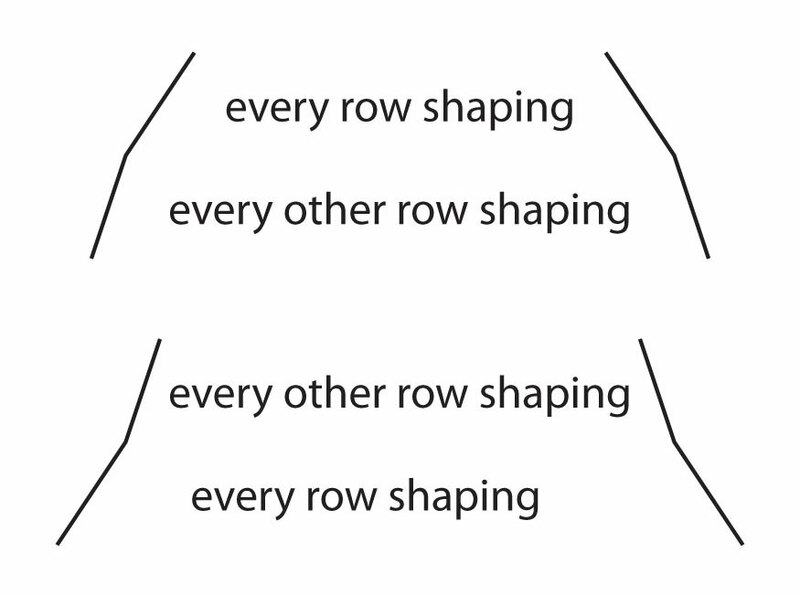 Line 31 shows 1 round worked with increases on the body and sleeves, then line 32 shows 1 round worked with increases on the sleeves only. 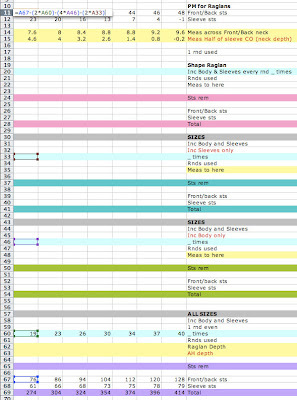 The light blue (line 33) shows how many times we will repeat those 2 rounds. So, on line 34 we add lines 31 and 32 together and multiply them by line 33 for the total number of rounds worked in this section. On line 35, we divide the rounds for this section by the row gauge, and add them to line 22 to get the total measurement to here from the cast-on. 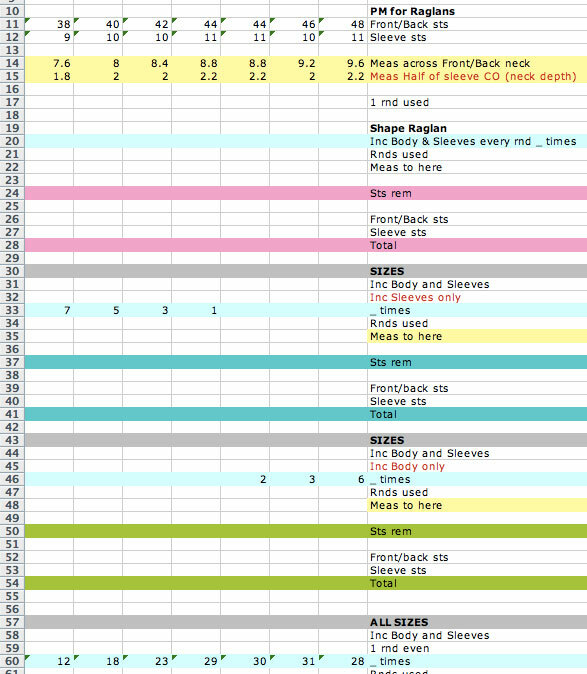 Repeat entering row and measurement formulas for each shaping section, being sure to add the measurement for each section to the previous measurement so you'll have the total measurement from the cast-on at the end of each shaping section. When you get to the end of the last shaping section you'll have the total measurement of the raglan shaping from the neck to the underarm (line 62 shown below). 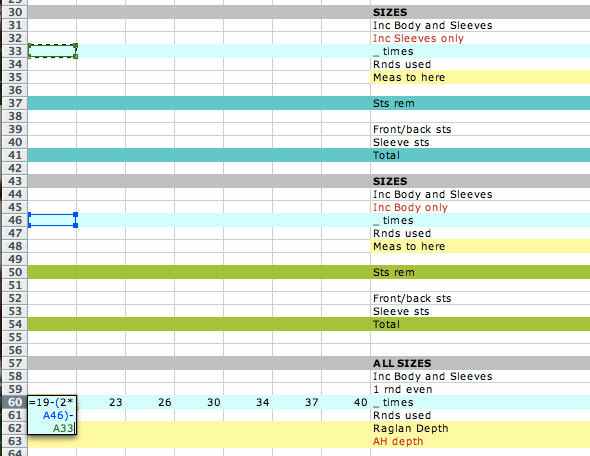 Add this measurement to the neck depth measurement (half of the sleeve cast-on measurement) to determine the total armhole depth. 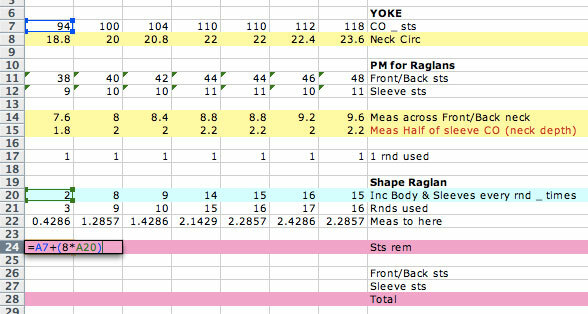 Ideally, I like the armhole depths to range from 7–10", so it looks like we'll need to reduce them a bit. We do this by working more body/sleeve increases every round at the neck edge, and fewer every other round at the underarm edge. 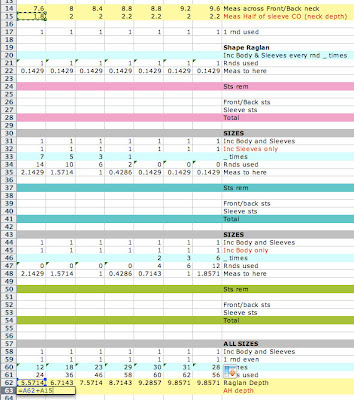 We don't want to mess up the number of total body/sleeve increases, so we'll need to update the formula on line 60 (the every other round body/sleeve increases) to exclude the number of times we work the body/sleeve increases on every round. Similar to when we adjusted this line previously, we'll want to adjust each size individually so the total number of increases (19 [23, 26, 30, 34, 37, 40] stitches) remains in tact. And, we'll need to adjust the formula for the Front/back cast-on stitches and the Sleeve stitches so they don't change from the numbers we have them set at. 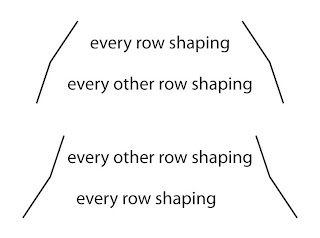 This is done by subtracting 2 x the number of body/sleeve every-row increases from the formula that is already there, because there are 2 stitches increased on each back, front and sleeve per increase round. 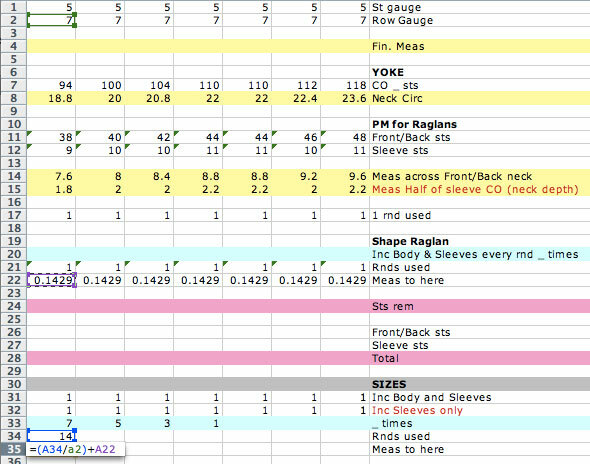 Now we can begin trying numbers in line 20 (body/sleeve increases every row), while watching the measurement of the armhole depth, adjusting the line 20 numbers to give us an ideal armhole depth measurement. We're ALMOST there. The very last thing we need to do is fill in the stitch counts for each of the shaping sections, and make sure that they work out correctly from the neck cast-on to the underarms. Cross your fingers! Beginning at the neck cast-on edge, I fill in a formula on line 24, which adds 8 stitches for each of the body/sleeve increase rounds worked on every round. To double check that, I add 2 stitches to each Front/Back cast-on stitches and 2 stitches to each Sleeve cast-on stitch count. For line 28, add the Front/Back stitches to the Sleeve stitches twice (because there are 2 of each). Line 24 and line 28 should match. That's why they're both pink. This step gets repeated for each shaping section, being sure to add the accurate number of stitches per repeat. For example, for the second section, there is 1 round with body and sleeve shaping (that's 8 stitches increased), and 1 round with only sleeve shaping (that's 4 more stitches), so the total stitches will add 12 stitches per increase round. And, for the body, there are 2 stitches each repeat for the front/back, and on the sleeves there are 4 stitches each repeat. When you add together the Front/Back and Sleeve stitches, they should match the total number of stitches figured from the total stitches of the last section. If they don't—there may be something up with your formula in regards to the number of stitches increased for each sleeve and body per repeat. From this point on, for a really easy pattern, you could knit the body and sleeves completely straight for whatever length you want, trying the sweater on as you go… and you're done. 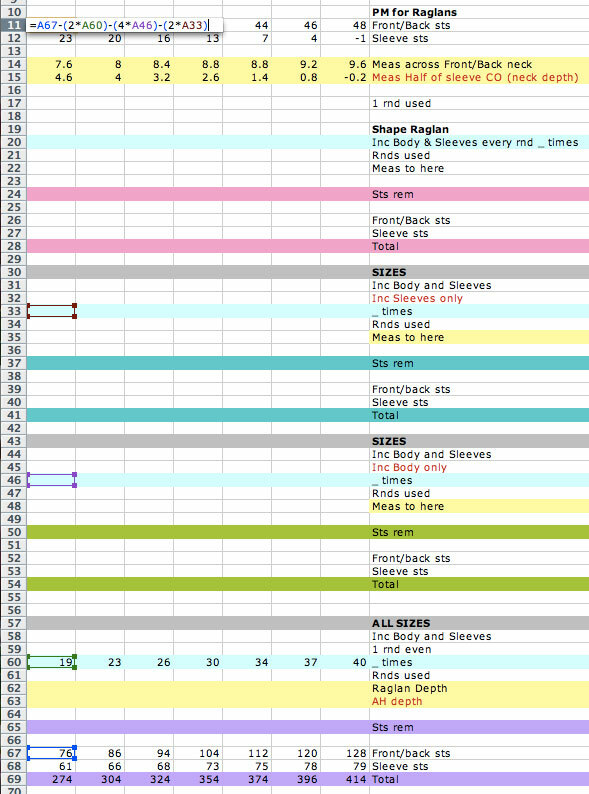 Here's a pattern written out in detail for all the stuff we just did. 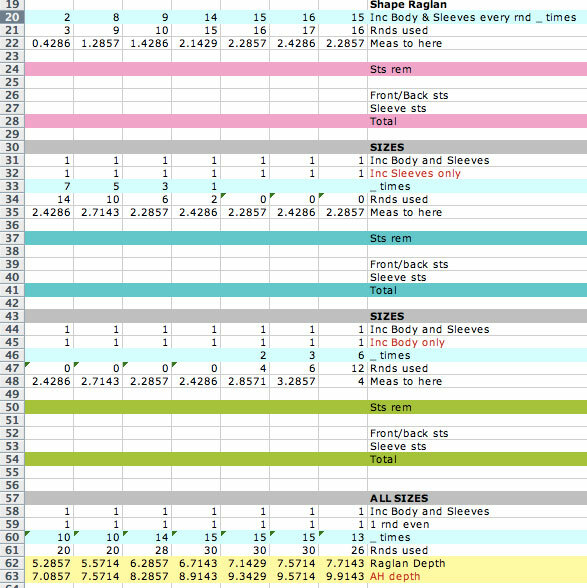 And, if you want to download the excel spreadsheet, to see the whole thing in detail. Here's that too. Please consider donating any amount (even just $1) to support the free information Kristen offers. Such a huge mystery for me...SOLVED! If you were here I would give you a huge hug! Thank you so much. I know how much time and detail you have put into this and I sincerely appreciate it! I'm glad it has helped you out! Wauw - I'm really impressed and glad to find another excel-fan. I will definitely take a closer look at your spreadsheets. It seems very useful - can't hardly wait to "play" with it. I have always loved working raglan sweaters from the neck down, but your instructions are so thorough and easy to follow. Yours is a major contribution and I would like to applaud you. Thank you so much for this information. I have downloaded it into my computer and will have it available any time I need it. Jean, I'm so happy to share what I know with others, and I'm glad you think this is useful! This is awesome! I'm a bit of a nerd (ok, a really big one) and I've often wondered how I could create something like this. Knitting is an art, but the engineering-part of my brain is constantly questioning why so many designs can't just be explained as formulas. Great job and thank you for sharing! I think many simple designs can be explained as formulas—though it's not the norm, so people don't tend to do it very often. The more complicated a design gets, the more challenging it is to make into a formula, and so many of the designs coming out these days are pretty complicated. IMO. 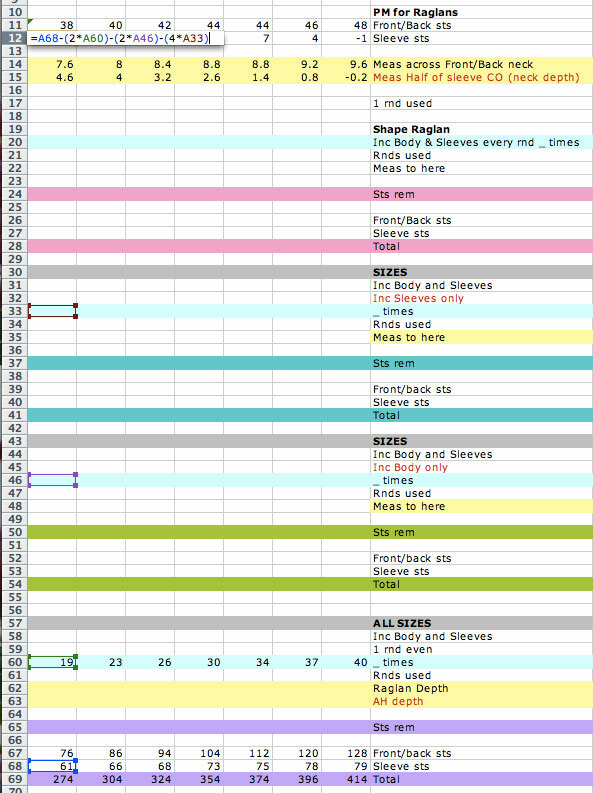 A knitter who does excel! I am in a happy place. Me too! XOXO Happy Excelling. I have been using Excel for years to ensure I understand the pattern and to create a clear, clean pattern customized just for me! Thanks so much for sharing you work, I really appreciate it!!! You're very welcome. Knitting is about 90% (don't quote me on that %, it's an estimate) math, and that's what Excel is great at, so it's pretty natural, I think, to use them together. Thank you so much for these instructions. I just ordered Your first book. With adding these instructions I will be able to knit easy Things that fits well. My trip to Interweave - in pictures! A second book - in pictures.